Our last night in the train was a good night. We all slept well and the kids were compliant this morning as we loaded up and left a bit earlier than we have any other of our trip mornings. After I had pulled out the kids clothes for this morning and loaded the car last night, Robby kidded with me asked if anyone had any ‘baseball’ clothes. I just glared at him and said that if they did they would be in the car but this morning when I started to pass out clothes, I noticed that Anderson’s shirt did in fact say ‘baseball’ on the front. As we were loading up to leave, Whitman asked me as sweetly as he could if we could play on the playground. Unfortunately, we just didn’t have time. He was fine with that though since I was passing out breakfast-sausage biscuit, pop tart or fruit loops. The kids ate quietly as we zoomed on down the road. While they were eating, I was working on finishing off my cinnamon raisin bread from yesterday. Robby was a bit bitter that I didn’t come back to the car with more than cinnamon raisin bread. I was really looking for bread for sandwiches for today but he had his eye on the sign out front that said “world famous sticky buns.” However, there were no sticky buns in that store. Back to today, we made it about 2 hours before we stopped for a restroom break. The weather was already looking cooler and the mountains that we were driving through were just beautiful. The kids did their school work and then I passed out presents from Grannymom. I just passed them all out and the kids, on their own, took turns opening and showing each other what they had received. We stopped at Steamtown National Historic Site in Scranton. It is just amazing the things out there-our park service is just pretty cool. We ended riding on a short steam train ride which went through the train yard. The kids sat as still as possible as the train squeaked and swayed down the tracks (if we had been on it for a few more minutes, I would have been sound asleep). We walking through a round house and saw a turntable. Whitman was again in train heaven. It gave us a good chance to stretch our legs and when we left, we swung by Sonic since today was 50 cent corn dog day. Robby bought a bit more gas as I passed out the corn dogs, chips from yesterday's chip factory and lemonade. Then it was back on the road headed to Cooperstown. I drove a bit and even though it was 3:30 when we arrived, it felt more like 6:30. It is cool out and overcast and I do believe that I could have curled up and taken a nap instead of walking through the Baseball Hall of Fame. Cooperstown is the cutest little town-Robby and I should have been keeping a list of all of the towns that we have said that we could come back and stay someday when we are old. The museum was busy with lots of young baseball players walking through. They must be having some type of championship here because it was a happening place. 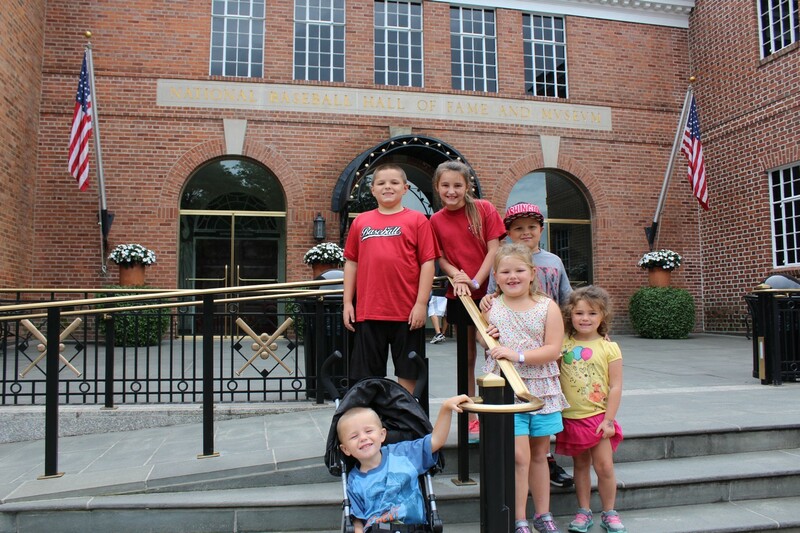 There were 3 floors of baseball related things and the kids enjoyed seeing all of the items. The most entertaining thing to me was watching a clip of the Abbott and Costello routine about Who being on first. The kids all watched it but I am not sure how many of them actually understood the comedy in it. After we walked through, we headed to the gift shop-Reagan bought a really long pencil (her 3rd pencil to buy on the trip), Graham bought some baseball cards and we bought a baseball that had the Hall of Fame logo on it to join our Louisville Slugger bat on the Christmas tree this year. We drove around the town a bit after take a few pictures in the sculpture garden. Then it was back on the road to tonight’s hotel which was about 2 hours away. And speaking of the road-we are in New York so you would think that driving would just be interstates but about an hour and a half of our driving was on little bitty roads-like driving on a very scenic Lawson for miles and miles. The countryside that we were driving through was absolutely beautiful but still, I was becoming a bit concerned about the reliability of the GPS. Thankfully though we found our hotel and unloaded. Robby let the kids swim while he started the laundry. They had an indoor and an outdoor pool so the kids tried both. The outdoor pool was pretty cold but Campbell was the only one who wanted to stay in it and did later for a long time. Swimming seemed to wear everyone out so when we came upstairs we quickly showered and then made sandwiches for supper. The laundry was a mess tonight-I guess we tried to fill the washer too full so it didn’t run until Robby was loading up clothes to take to a laundrymat. It started running so we just had 2 loads of clothes which finished late in the evening instead of one load done early in the evening. Tomorrow is another early day-we still have to finalize some of our plans but Ben and Jerry, cider, syrup and a covered bridge are on the current agenda. We all slept fairly well in the caboose last night. Right before we went to sleep, we heard a loud and odd noise. The kids all immediately asking, “what’s that?” I quickly and calmly responded, “oh, it is just the fridge.” As I said that I was looking at Robby as he was looking at me and we both knew it wasn’t just the fridge. That answer calmed the kids down for about 20 seconds when we heard the sound again. This time I replied with the same response but Keaton shouted “it’s moving.” Up we went with all lights on and sure enough a big bug was right by her. Robby and I grabbed shoes while squinting at whatever it was near our baby. He got the big cicada in the first whack and quickly disposed of it outside. We laid back down hoping that there weren’t any more bugs in our room and thankfully, there was not...or at least there were no more noisy bugs in our room. The train depot is right across the street and we had such fond memories of coming here 7 years ago and today did not disappoint. 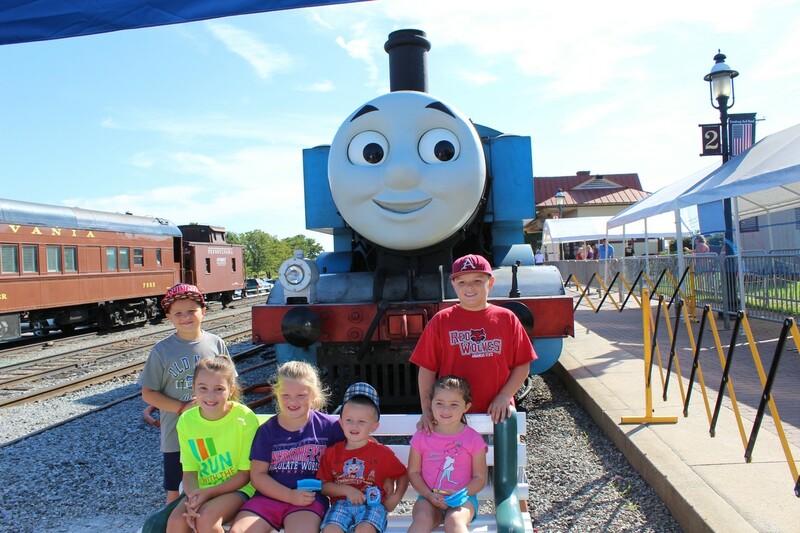 We were early enough to take a picture of Thomas and Percy. Whitman would sit in front of those trains and give the most perfect smile, something he never usually does for us. His smile was short and probably so short that we didn’t even get it on camera! Then we boarded the train for our short little train ride. Robby, Campbell, Anderson and Graham rode in the caboose of the train. They were way up high and had a blast-a train man told us that he thought those were the best seats in the house. I was with Reagan, Keaton and Whitman and we were in an open air train car and it was pretty nice. The train ride was only 22 minutes long-as soon as we got settled, it was over. We did opt for the shorter ride so we could ride with Thomas and that was fine because when the ride was over, the kids all were able to ride on the cranky cars a few times. The cranky cars are little train cars that you pedal with your hands instead of your legs. It said that you couldn’t do it if you were over 54 inches and I am pretty sure my big people are. I showed them this but told them that they could try anyway. Reagan wasn’t going to do them until she saw that the boys were able to do it and then she jumped in line and was right beside her brothers cranking those cars. Whitman got off very well when his turn was over but he wasn’t finished riding and wanted to get back in the line. We let everyone do it 3 times and then headed to another area they had set up for kids. They had train tatoos for the kids, a music station where you could play instruments and even sing on the microphone and there was another area with lots of trains and blocks to play with. As we were leaving Sir Topham Hat, a lady handed Anderson certificates for the kids. I was a few steps behind him and when I walked down, she asked if his daddy was in the military. My first thought was because of his haircut and I answered that he was not and asked if she was thinking that because of his hair. She said “no, because he said ‘yes ma’am’” and then she went on to compliment his manners. Once we were back at the hotel, we worked on the car a bit and had a drink. The kids watched tv while I ate some of the cinnamon raisin bread that I bought on the way back. Campbell and Robby ran to vacuum out the car so tomorrow the car will be perfectly clean and ready to go for our longer drive. I tried to work while they were gone-organizing bins, filling water bottles, passing out drinks and straightening this caboose. We are a bit more organized right now and do feel like we have some more room but it is still tight in here. All that to say, at least 2 kids have said that we could live here. Once Robby and Campbell came back, we stayed inside for a little bit longer since it was still pretty hot. He had some work to do and the kids were content watching the tv. Campbell almost dozed off for a bit and just as I started to close my eyes, I heard Robby telling people to put their shoes on. We went outside to the petting zoo area. Robby bought some food for the kids to feed the animals and it was pretty comical watching them try to feed those animals. I am no help at all because animals just aren’t my thing but I sure did enjoy the kids squirming and squealing as the animals gently ate out of their palms. Then we walked just a bit to the playground and the kids made some new friends and played hard until we finally herded everyone up the grain silo. Well, Robby herded them up the silo-someone had to stay on the ground to take pictures. It was quite a haul up the silo and Robby had to hoist each kid up so they could see out the window. I believe that he said that I took about 75 pictures of the silo. In my defense, I sure didn’t want to miss the picture op and at one point, I took at least 20 of one kid hanging out the side-I thought it was Anderson but it was not. They climbed down and we headed to eat pizza at Strasburg Pizza. It seemed to be a local place and less touristy. When you looked over the counter, you could see the man making the pizza and that is where Campbell and Keaton stayed for a good while. From where we were sitting, we could hear Campbell telling them that we were from Arkansas, were on a road trip, saw Thomas, had 19 more days to go and on and on. It is probably a good thing that she doesn’t know our social security numbers! Once everyone went to sleep last night they all slept great. The movie that we watched last night didn’t even end until after 11:30 and Whitman stayed in his sleeping bag but he tossed and turned. At one point, he was slowly sneaking towards my bed when Robby came up behind him. Finally, he went on to sleep and was one of the last ones to wake up this morning. Robby woke up the big kids first and asked if they wanted to go to breakfast with him. Reagan didn’t really stir but once she saw the boys moving almost ready, she jumped up and was ready very quickly, which is saying a lot because she is a tad bit on the slow side, but she wasn’t going to pass up a chance to eat breakfast early. While they were gone, I quickly had a shower and then helped Campbell and Keaton dressed. We had almost dressed Whitman when the others returned with his breakfast. He didn’t mind not going down the hall to eat breakfast and was happy with the selection that Robby had brought back for him. Reagan decided to go back to breakfast with her sisters and had herself some hot chocolate this time. Since this was our last hotel breakfast for a few days, I ate a cinnamon roll but then couldn’t decide what else I would like to eat. A bagel and cream cheese is my all time favorite but the cinnamon rolls are a special treat so I just had a few pieces of cereal and then we headed back to the room. The kids occasionally watch Charm City Cakes so we drove by their shop. 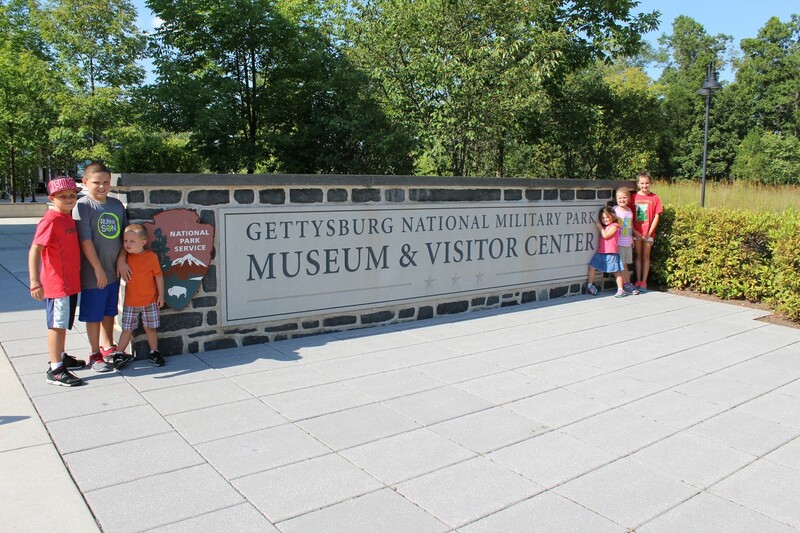 A few kiddos jumped out and I snapped their picture before we went back into the car and headed to Gettysburg. I had to stop there for a few minutes and try to remember what happened on our drive there but it finally dawned on me-school work. My people have been tired in mornings and then when I give them school work, their tiredness just turns into crankiness! Poor Anderson liked to have never finished his math page and bless him, the boy usually always gets everything correct on math and never misses anything. But today, he missed practically every one-they were just careless mistakes so I didn’t make him correct them this time but hopefully he will figure it out before tomorrow’s work. Now, Gettysburg-I have only been there twice (possibly 3 times but we couldn’t really remember) but goodness, why does it have to be so hot there? By the time that we had parked and walked to the visitor’s center, we were completely drenched with sweat. But the visitor’s center was very nice and soon Robby was in line to buy tickets for the film, Cyclorama and museum. I wish that I could tell you about the film but Whitman was sound asleep in my lap after just 1 or 2 minutes and I quickly dozed off too (don’t tell Robby.) Robby had already told the kids that he was going to give them a quiz after the movie and I was sure hoping that he wasn’t going to give me one too. Next up was view the Cyclorama-largest oil painting in America and more than 150 years old. It depicted a scene from the battle at Gettysburg and as they read the story, different lights shone on the painting almost making it come to life. It was pretty cool-the painting was in a big circle and you could walk around while looking at it but I just sat looking at one area since I was holding a sleeping Whitman. From there we walked through the museum and it was really nice-the kids are learning the Gettysburg Address this year and that is all Reagan was trying to do-memorize more than what she already knows. After the museum, we spent some time in the gift shop for a bit and then loaded up to drive around the battlefield. We did stop once to seeexactlyy where Lincoln gave him famous speech and drove down a few drives seeing the many monuments and memorials. The kids were in a really good mood during all of this because Robby had bribed them with McDonald’s sundeas. It didn’t take too long for us to almost make it to the hotel. We decided that we would have nachos for supper since we just needed some cheese for that meal. We would have a microwave at the hotel and would be able to heat everything up so we looked and looked for a store. We ended up having to back track a good bit to find a store. When we did drive up to this hotel, the kids were all very excited. I don’t think that anyone really remembered this place but they all couldn’t wait to climb out of the car. They almost all fell out of the van trying to get out. We found our train car and everyone shoved in trying to look around. We have a caboose with a double bed and 4 bunk beds-Robby said that he is glad that he didn’t try to get by with a smaller train car than this. We are just a wee bit crammed into this caboose but it sure is fun. After we unloaded, we heated up nachos with our leftover bbq and then topped all of that off with ice cream and popcorn. This is the life! Then kids then cycled through the shower and soon they were all in bed. It was still near 11 when they all went to sleep. I am not sure what is wrong with us-keeping these kids up so late but there is so much to see and so little time! Around 2 this morning, Graham was at my bedside saying that Keaton had taken his covers. I didn’t look to see if she had actually taken the covers but just rolled over for him to climb in bed with us. The bed was tiny and it was pretty warm in our room so those of us in the bed were hot. I eventually made Graham move in the middle but we all still slept soundly. Robby had been to the National Zoo when he was in 7th grade but the kids and I have never been there. We were able to find parking on the street, saving us 22 dollars. We only had about 2 blocks to walk to the front of the zoo. It is a big and shady zoo. Our first few animal stops were a disappointment since the animals weren’t there. But soon we started seeing a few different animals. We saw a Red Panda and then we finally found the animals that we had been waiting for: the Giant Pandas. We saw at least 3 of them and they were indeed pretty cute. At one point, we did stop so we could see the otters being fed and we pretty quickly realized that we weren’t in the South anymore. Those big ole tall people pushed their way up to the front and the poor little kids were left in the back to look at people’s hineys. My kids didn’t really care so off we went to see something else. We viewed quite a few elephants from a bridge-the elephant habitat is about 6 times the one at home. We viewed a spotted leopard and then walked down a very large hill and saw some seals and sea lions. They were pretty impressive and I could have watched them for a good while. Now when we were viewing these things, all I could think of was that we were at the very bottom of the 8/10th of a mile hill and then had to walk right back up it. Eeek! We kept on the path and realized that we were walking up the hill while seeing some animals-possibly a short cut. Eventually, our shortcut ended and we were back on the main hilly path. Robby had bought us popcorn and a lemon icee on the way down, so we knew that we weren’t going to get anything on the way up. The kids huffed and puffed-probably since we were making them push the strollers. Poor Keaton even had to walk a good bit up the hill. I was just thinking about sitting down and crying in the middle of the hill when I looked over and saw the visitor center, where I had entered when we walked into the zoo looking for a map ($5-I passed) I knew we were there and so did Robby because he was up ahead telling the kids that he saw a 7-11 across the street. Despite the mouse crawling around on the sidewalk out front, we all still went in and retrieve our slushies. They were the best things ever. From there is was just a short skip and a hop to our car. We hung out in the grass until the car cooled off and then we headed back to the National Mall. We found a pretty good parking spot-Robby’s parallel parking skills are improving and as of right now, I do not think that we have been honked at once in this trip. Once we parked, I climbed in the back and started making our sandwiches and tortillas. The kids are kind of funny since they eat the same thing every day even when we have quite a few options but I guess that Robby and I have been eating the same thing each day too. After we ate, we walked over to the Air and Space Smithsonian-it is one that we could go to each year. We spent quite a bit of time in the hands on section about flight. Keaton and Reagan found a presentation and sat down to listen to it. I am usually not a presentation person but Reagan came up to me and said that it was really interesting. So I went and sat with them along with Whitman. As we walked up the presenter had just twisted a twirly thing and it bounced off Keaton’s head so she was loving it. Graham, Whitman and I had been there for just a bit when the presenter had Graham come up to help him with a presentation. The presenter was really good and would ask questions. When he did ask questions, Whitman would of course answer with something. Now, a few times he answered wonderfully correctly but other times, he would just say a random word but the presenter would take what he said and make Whitman’s answer seem correct. Soon Reagan was up demonstrating pitch, yaw and roll. After we finished listening to the little show, we walked around to a few other exhibits and even saw the original Wright Brother’s plane. The kids really enjoyed spending the last few minutes of their Smithsonian time at the gift shop. Keaton gets mad at me each time that I won’t let her buy something-she probably doesn’t need a Hello Kitty in a spacesuit or a 5 foot kite. Graham had bought a hat but wants another one even though he only has 4 more dollars to spend and my Reagan has only bought 3 pencils! After we finished in there, we went out to the National Mall for one last look at the Washington Monument before leaving the city and heading to Annapolis. We found a spot to park and walked just a bit to check out the little place that Robby had found for us to eat. When we walked up, I remembered that I had seen the same place but when I did my trip activity finding, I didn’t think that we would be in Annapolis near supper time. 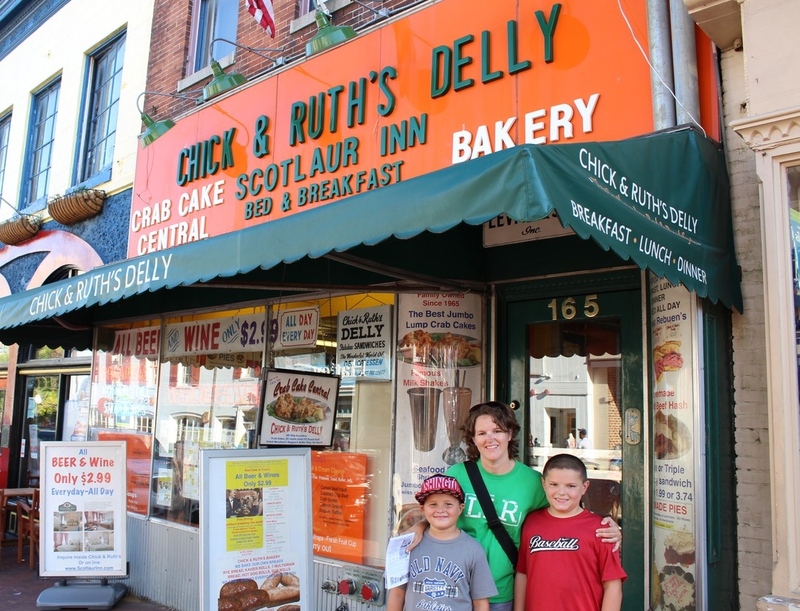 We ate at Chick and Ruth’s Delly. The place was small, small but they said we would only have to wait 5 minutes so we hung out on the sidewalk while Whitman slept. Once they sat us inside, we quickly found what we wanted to order-a jumbo crab cake, a 1 and half pound burger and a 6 pound cookies and cream milkshake. That was definitely enough for us-the burger was okay but nothing special. The crab cake was delicious and of course, we all loved the milkshake. Whitman had been sleeping and he woke up just before they delivered the milkshake to us. His eyes got big and he said over and over again, “It’s so big, it’s so big.” The kids took turns passing it around-the milkshake may be been 6 pounds but the glass weighed at least that much. I was a nervous wreck the entire time afraid that we were going to spill that glass-if we had, we would have spilled that milkshake on 4 other people since we were packed in that restaurant like sardines. We drank every bit of that milkshake and had pretty full tummies. So we had to walk it off and strolled down around the waterfront. It was so neat walking along the dock looking out at all of the boats. The evening was pretty pleasant and Reagan even commented, “This is just like Disney World but without the rides.” It was just that perfect. After a good stroll, we ended up at the Naval Academy. The boys certainly enjoyed that picture stop and from there we weren’t too far from the car. We were about 10 minutes from our hotel and quickly found our way there. This is another Holiday Inn Express so we unloaded and started on showers. Robby checked on the laundry and since it is free here, how could we pass it up! We ended the evening with watching the next National Treasure movie. We briefly woke up around 3 this morning and I was relieved that this time when I woke up in the middle of the night, we still had plenty of hours left to sleep. Around 7:30, we started stirring an Robby got in the shower and I tried to wake everyone up. I opened all of the windows and pulled pillows out from under heads and snatched blankets. When Robby had finished getting ready, I still didn’t have anyone awake. Once Robby started telling everyone that the first folks ready would go to breakfast with him, then everyone started moving a little quicker. Everyone, except Reagan, was almost ready when Robby decided that it was time to leave. I just had to do her hair but I don’t think that she minded waiting a few more minutes on me since I was still getting ready myself. It was a win-win for me-I didn’t have to rush getting ready and he already had breakfast for everyone. After we ate, we ran back to the room to gather everything and then right down to the van. Unfortunately, we had to leave our wonderful parking spot this morning but luckily for us, we found another perfect spot right in front of the Natural History museum. It helped that today was Saturday and the museums didn’t open for another hour. The kids and I jumped out and took a picture of the capitol. Graham wanted to take a tour of the capitol building again but we had to explain that we did last year and the last time that we were here. You really could stay in D.C. for a week and not see everything. We then sat in the shade and waited for the archives to open. Once it did, we walked right on in and saw all of the famous documents. It has been a while but the kids and I read a book about the Declaration of Independence-he was carried in a horse and buggy, stored under a church, hung in a smoky room and I don’t remember what else before it made it’s way to the National Archives. The Declaration is so faded that you can barely see John Hancock’s John Hancock. We walked on through the museum and then to the gift shop. I know that I have said this before but I really, really love gift shops. I never buy anything but Christmas ornaments but I just love them and could spend lots of money. Reagan bought 2 pencils and Keaton bought a necklace at this stop-they have a bit of money and everyone is anxious to spend it. After the Archives, we walked through the National Sculpture Gallery. On the way there, Graham found himself a hat to buy-he looks like a gangster but he is a happy looking gangster. While sitting by the sculptures, I grabbed us a snack from the car and we rested for a bit. Then we headed over to the Natural History. It was pretty crowded and we are just not a big fan of crowds. We saw quite a few dinosaur bones, some butterflies and even the Hope Diamond. The kids were probably more interested in the gems and jewels area than most anything else. I would point out the different shapes of jewels and gems to Whitman and he would tell me that his favorite shape was a cube. I finally found him a cube and he said, “it is not an orange cube and I just like orange cubes.” I never found him an orange cube! When we left that Smithsonian, we left town for a picnic. We found a little marina on the Potomic and sat eating on a shady picnic bench watching the boats and seeing the planes land at Reagan National. It was a perfect spot and Whitman finished his nap while the boys played football. We stayed there for a good while enjoying the nice afternoon. Then it was back into the city for cupcakes. We bought a dozen cupcakes at Red Velvet cucpakes and went next door to eat them. I will not even tell you how much the a dozen cupcakes cost but let’s just say we could have probably rented one of those boats we saw today. The cupcakes were good and quickly devoured. Then it was just a short walk to Ford’s Theatre. Unfortunately, we weren’t able to see inside of the theater since they were rehearsing in there today. 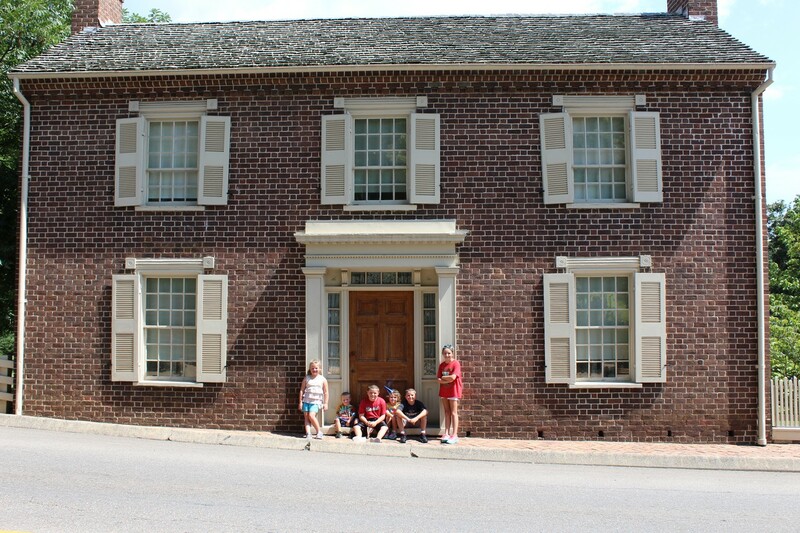 But we did take in all of the exhibits and went across the street to see the house that Lincoln died in. Robby had to move the car since his meter was out and we met him at the National Portrait Gallery. It was row after row of pictures and was pretty interesting. Pictures of presidents, pictures of National Parks and even some pictures of some naked people! In the courtyard, they had a fountain that the kids could walk in. Of course they loved this and splashed and splashed until Graham and Whitman were both soaked. When I called the kids in, everyone came...except Whitman. Nothing like chasing him around in front of a few dozen people watching you! After we had finished that Smithsonian, we headed to Georgetown. Robby had found a neat BBQ joint but the traffic was crazy. Apparently, everyone left in D.C. on a Saturday goes to Georgetown. So we just called in an order, I jumped out of the car to pick it up and was able to get back into the car before Robby had even driven a block. It couldn’t have worked out better. Then we headed back to the hotel. Robby dropped us off since all of the good parking spots were gone. He circled and circled looking for a spot while we went upstairs. I ran everyone through the showers and gathered the laundry while Robby finished parking and picked up some mac and cheese and drinks from downstairs. The BBQ was excellent and we ate most of it up. After we had finished our ice cream, Robby started the movie National Treasure and everyone has been watching it. The laundry finished and we folded it as we finished the movie. I am not sure that I ever remember watching that movie but it was full of places that we will see on this trip. Pretty good movie and a pretty good way to end our D.C. part of the trip. I woke up at 3 this morning when Anderson was making some noises and Reagan was about to fall off of the bed. I put his head on his pillow and shoved her to the middle of the bed and went on back to sleep myself. The next thing I knew, it was after 7 and Robby was in the shower and everyone else was sleeping soundly. He got out of the shower and started waking everyone else up and I climbed in the shower. And let me tell you, I am pretty sure that shower will be the best shower that we have on this entire trip. It was nice, nice-hot with lots of water pressure and that was a wonderful way to start the day. Soon all of the kids were dressed and we were heading to breakfast. Holiday Inn Express breakfast and my big boys were the only ones to eat a cinnamon roll. What in the world? The girls had toast and bagels-we could have had those at home but we sure never get cinnamon rolls at home. I had one and they were indeed delicious and then like the girls, I heated myself up a bagel! Robby took a few kiddos and they started loading up the van and the rest of us soon joined. Whitman had already guzzled about 4 cups of juice and quickly became upset when I would get him any more and his bad mood lasted for quite some time today. Once in the car, we passed out school work and started our drive for the morning. School work lasted for a bit and that was fine-nice quiet way to start the morning. The kids took turns coming up to the front seat for me to help them-I don’t think they all really needed help but I believe that really liked changing seats for a bit. After we finished school work, I passed out a little piece of candy and then we listened to a preacher man that Robby was listening to. Despite the traffic, our drive just took a bit over 2 hours to get to Mt. Vernon. The kids finished up their Lego movie while we zooned on through Virginia. Robby is already practicing driving like someone from the East coast-he has been crossing 3-4 lanes of traffic to exit. We made it to Mr. Vernon around noon and walked right towards the entrance. It was a bit far and we immediately realized our mistake of not bringing Whitman’s stroller. We had it in the car and debated but when he is hot and it is sunny, he does not want to walk at all. We survived and after a potty stop, we made it to the main entrance for our mansion tour. Robby and I went to Mt. Vernon years earlier but we did not do the mansion tour because the line was crazy long but we did manage to take a back picture in the front lawn. When we took that back picture, Robby is almost in midair as he ran to join me after starting his camera timer. We did recreate the back picture but this time Robby was able to join the family in time. The kids were very interested in the house tour and Whitman even attended well. My favorite areas are always the kitchen and all the rooms dealing with the preparing of the food. We saw Washington’s grave along with many gardens and even watched some archeologists dig up some remains. We had walked quite a hike so we took the shuttle bus back to the other side of the mansion. 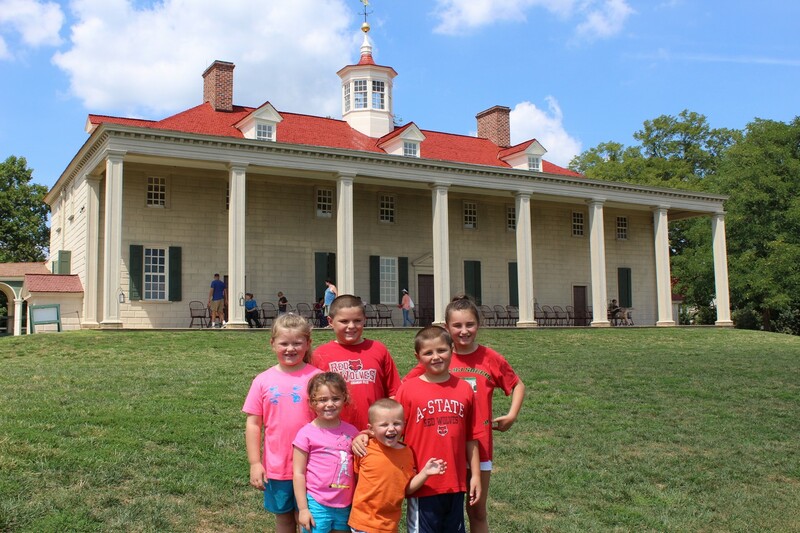 From there, we walked around some more and the kids finished their workbooks on the back steps of Washington’s home. We did go in one room where the kids made a spy wheel. As the lady explained the projectl, she asked if anyone knew what a spy was. Whitman was the Dennie that started talking and he said “a detective.” Um, yes, thanks to Mickey Mouse Clubhouse the child is brilliant. We were really hot and the kids were pretty tired so Robby splurged and bought them an ice cream treat. Then Robby, Graham and Whitman headed back to the car to cool it off for us. The rest of us went to the gift shop. Anderson bought a little pencil sharpener cannon, Keaton bought a change purse, Campbell purchased a plastic spyglass and I bought a Christmas ornament and a few postcards. My ornament was a bit on the large size so I thought I better let Robby decide between it and a magnet. He must not have been able to see the accurate size and picked the large one that I secretly wanted-it won’t be any larger than the antlers or tambourine hanging on our tree. Robby picked us up and the car was cool. Then we stopped at a park and had our lunch. It was a bit late to accurately call it lunch since it was 4. The kids didn’t mind because we ate near a playground-they were able to run over and play for just a little bit. They played while I fixed lunch and Robby did his work. The flies were pretty bad so we ate while shooing away flies. Then we continued our drive down the Potomac river towards D.C. When we approached D,C, we started to point out the Washington Monument and the Capitol building. When Campbell saw this she exclaimed, “What? We are going here, we have just been here!” It is true, we were here last year for a bit but Robby can never get enough of D.C. We made it into town right around 5:30 so of course the traffic was bad. We quickly found our hotel and then had to circle and circle and circle trying to figure out the parking situation. Once we did, Robby checked into the hotel. When he returned to the car, he said that it was just a “studio” and seemed a bit concerned about the space. But when the door opened, we were shocked-we have a queen bed, pull out couch, full kitchen and plenty of space. While Robby went to park the car, I organized the room and the kids quickly started to work-Graham and Anderson on legos, Reagan on a postcard and everyone else on their ipads. We had a snack from Nonna and rested for a bit as the sun went down. When we left the hotel, the kids really had no idea how much walking they would be doing in the next few hours-Robby and I were as prepared as we could be to walk mile after mile. We weren’t too prepared for how hot it would still be, not just hot but hot and muggy. We were nasty sweaty after just the first block. Just about 2 blocks from our hotel is the White House. Last year when we were here, as soon as we made it near the White House something happened and the Secret Service people started shouting at us to back up. I had to hold one of the kids up so they could at least see the White House as we backed up. This year was nothing like that-we were able to take a few pictures and take in the president’s home. Then we headed to the WWII memorial and walked around it for a bit. 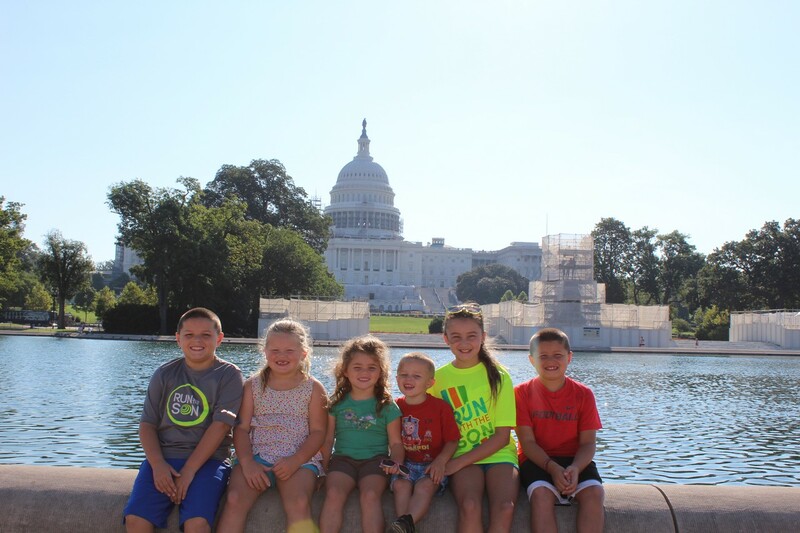 We were so hot that by this time, we had already bought a bottle of water and filled it up numerous times and even let the kids put their hands in the reflecting pool. It shouldn’t be that hot at 9:00. Then it was just a short-ish walk to the Lincoln Memorial. I do believe that is my favorite memorial and the kids seemed to enjoy it as well. Everyone stamped their National Park Passport books and then we headed towards the Vietnam Memorial. I tried to get Robby to walk on to the Washington monument but since it was nearing 10 and we hadn’t had supper and still had a mile and a half to walk back to the hotel, he wisely said we needed to head back. There is always tomorrow. There is a CVS on the bottom floor of this hotel and we bought 3 microwave pizzas, a microwave mac and cheese, a stouffers meatloaf meal for Robby and a lean cuisine sweet and sour chicken meal for me along with some ice cream and headed back to our room. Robby started the shower rotations while I started heating up meal after meal. Soon we were all clean and sitting around eating our late, late supper-11 is probably too late for folks to be eating supper but no one complained since they were all starving. Once everyone was bedded down, we started the dishwasher (chores never end-even on vacation) and sat down to do the blog. I probably should go right to sleep now since Robby will be up at the crack of dawn ready to explore this city (and to feed his meter.) Once when we were near D.C., a kid briefly woke up at 4 in the morning and instead of trying to get them back to sleep, Robby just woke them up and put them in the bathtub. By 5, we were loading up and driving to D.C-there are few crowds at 6 in the morning and lots of parking that early but I am hopeful that tomorrrow we don’t start just that early! Robby woke up this morning to use the bathroom and I sat up to see what time it was. It was 6 and I was so relieved that we had made it through the night successfully with everyone sleeping soundly. I didn’t feel that rested but really I never do! I went back to sleep and the next thing I knew, Whitman was walking around the room. He was sound asleep when we went into the hotel last night so he had no clue where we were. Graham saw Whitman first and told him to go to me and I guess that is what woke me up. I coaxed him in bed with me and we stayed there for a bit. When he was in bed with us, he told me that he wanted to go back to Josh and Zach’s house. I tried my best to explain to him that we were on a vacation-he didn’t really care about what I was talking about. He just wanted to know if we were going to a restaurant. Graham was the first one awake, awake and he volunteered to take a shower before Whitman. Whitman needed one from his yesterday’s episode (he is feeling just fine today-knock on wood.) Then the rest of us started getting ready and loading up. A hotel, is not a hotel unless it has a breakfast is a firm belief of the Dennie kids and even though the breakfast this morning was light, it was still plenty-waffles, muffins, sausage biscuits along with cereal, fruit and toast. After we all ate and ate some more, we headed to the car. Reagan was carrying with her two slices of toast and I had my toasted and cream cheese filled bagel with me. The kids had asked us about 20 zillion times about opening the present from Grannymom that she had packed for them. We told them that they could open them after they did their school work so before I could even buckle my seatbelt and get everything settled in the car, they were asking for that work. I am certainly glad that they want to do their school work but I am afraid that they will have no motivation tomorrow to do it then. The boys were finished within 10 minutes but Reagan had math and her grammar (10 sentences where she has to label all of the nouns, proper nouns, adjectives, articles and pronouns) and it just takes her a while-takes me a while to grade it. Speaking of, I am not really sure where that paper got off to. Robby did a bit of work so I drove and drove and drove. I don’t mind it as long as I have something to eat so I don’t get bored. At one time I said that I felt like a race car driver-driving fast around crazy turns and hills. Robby passed out the kids gifts from Grannymom and they acted like it was Christmas time. Shortly after that, Robby started Anderson’s first movie pick-Star Wars. Now, I am not too much of a Star Wars fan, nor is Reagan, but Whitman found something very funny about the beginning of the movie. He would laugh and laugh and at one point, he shouted over and over “that’s an ugly girl.” We don’t really ever say “ugly” but I guess he knows the term since Robby looked back and said that the girl was indeed ugly. Since we were so close to a Russell Stover store, we did think that we needed to run in since we always need more food. Robby let everyone spend a dollar and soon the entire back of this van was covered with chocolate. It was worth it though because that chocolate was delicious! Then we pressed onwards for just a bit longer and made it to Andrew Johnson National Historic Site. Inside of one building, they had Johnson’s tailor shop. He was a tailor before he became president and is also known as the Constitution President, I am not really sure why that is but he did add many amendments to the constitution. Then we walked down the road to his home. From Andrew’s tailor shop to his home is quite the little hill even though it is just 2 blocks. And it is hot here in Tennessee today-now it is not as hot as it was last year at Andrew Jackson’s house but goodness, when does it cool off? We looked around Andrew’s grounds and then Robby and Graham volunteered to walk down the hill to go and get the car. They had it cooled off by the time they picked us up. We then went over to a park and had our picnic. It was oddly deserted but did have a little trail that we played on a bit. The kids threw around the football while I made sandwiches and tortillas for everyone. The lunch choices were plentiful today-chips, apples, grapes, cheese, meat, peanut butter and nutella. We didn’t even open the dip, salsa, pimento cheese or meat sticks since we need to save some favorites back for another day. The picnic spot was perfect for us-even though the men’s restroom’s water was off so they couldn’t use that one and the women’s restroom had no light so you had to leave the door open. We ate, played and then all pottied and headed back on the road. This day was originally supposed to begin at 5 this morning at home and end today in Salem, Virginia. Since we left yesterday, we were able to take it a little bit easier today but we did drive further which will help us out tomorrow. You do forget how beautiful the drive through Tennessee and Virginia is. We finished the Star Wars movie and then passed out ipads and I am sure that the grandpas both began getting a ton of texts. We drove for another good little bit and then we pulled off the road to see a big pencil. Yep, a big pencil! It was pretty large but not gigantic. The kids obediently climbed out of the car to take a picture even though they weren’t too impressed. After all, they have seen a huge rocking chair, huge ball of twine, huge baseball bat, huge buffalo, huge Tulsa driller, huge praying hands, huge Paul Bunyan, huge ox and a huge doughnut so seeing a medium sized pencil was probably not that exciting! It was a good little stop for us to stretch our legs and would have been a cute little town to walk around in but we drove on down the road and walked around at the gas station to potty while Robby was topping off the gas tank. Next stop was Roanoke and it also seemed like a cute little town. I had found a neat little place online for us to eat, the Texas Tavern. They can serve a thousand people.....10 at a time! Ha! So seating 8 people at the 10 person bar would be a bit difficult so we just ordered from the window and then took our burgers and hot dogs down a block and ate on the steps of a pretty little Methodist church. The kids had regular hot dogs and hamburgers but Robby and I had their cheeseburgers that had a fried egg on top. They were pretty good-but Anderson tried a bite of Robby’s burger, which didn’t even have mustard, and spit it out! My kids are weird. The kids all took their showers and then had a bit of time to play on the ipads before bedtime. We are all snug in our spots tonight and this room is like a palace compared to last nights. My kids are pretty pumped because this is a Holiday Inn Express which means cinnamon rolls in the morning! On our calendar, Robby named this year’s road trip as “Epic Road Trip” and I guess just to make it even more epic-er, we decided to leave about 12 hours earlier. We had thought about sticking around on Wednesday night so they kids could go to church tonight I could help out but we decided that there wasn’t too much of a difference between missing 3 weeks or 4 weeks of Wednesday night church. Yesterday, Robby was the one making a big breakfast trying to clean out the fridge but this morning it was Campbell and I frying eggs. We had a dozen eggs to use and cooked 10 for breakfast (the other 2 Keaton dropped in the floor later in the day so nothing was wasted there.) Campbell is quite the egg frier and I would have been but the pan that I was using is on its last leg and losing its nonstickiness. After breakfast, the kids had a bit of school work left over from the past few days. We had finished all of our school and started on our first round of chores by 10. The kids worked hard for the most part but the biggest ordeal today was picking up a zillion legos that everyone is using to make their lego videos. Once that was over, we headed upstairs to make those beds. Then it was on to showers and after showers, I painted Keaton and Campbell’s toenails and fingernails. Whitman came in and was pretty disappointed that I wouldn’t let him paint too. I then sat down in the school room to pull out Campbell’s school for when we were going to get back. The kids were busy with their ipads and left me alone which helped that go quicker. Then we had lunch-you wouldn’t even believe the assortment of food that I pulled out of the fridge and pantry to feed everyone. It included a half of a hot dog apiece and half of a nutella filled tortilla, colored marshmallows and a host of other random items. Then we began our second round of chores. This round was easier and the kids were delighted when Shannon showed up with cookies and snacks for our road trip. They were delighted because this meant more goodies for the trip (they are lucky there was even any left for them) and delighted because that meant they got out of work for a little bit. Once she left, it was back to chore time. Shortly after the last piece of laundry had been put away, I loaded up my crew and dropped them off at Pops’ house. They kept the kiddos for me while I ran back home and worked like a dog until Robby showed back home. We had a few last minute things to throw in the van and then we were off. Each trip, I usually go over the list of how we are packed. I always say that I could refer back to it the next time that we are packing but I have my 8 page packing list for that (seriously, 8 pages-I think I have a problem). So up beside me is my bag with magazines, all of our important papers, notebook and pens and this trip I have added a marker board so I can raise it above my head with things written on it each time they ask me to spell something for them. Now in every door, every pocket and every nook of this car is random things stuffed places like hand sanitizer, trash bags, carpet cleaner, air freshener, shoes, jackets and candy, lots and lots of candy. Between Robby and me is our new ice chest with all of our picnic items and a dozen or so cokes to help us make it through the long drives. The first row is kidless but it does have a set of 6 plastic drawers. On top of those is a clock so the kids do not have to ask us what time it is and there is also all of Robby’s equipment so we can watch videos or netflix on the road. The drawers contain bread, tortillas, ipads, kindles, computers, paper products, snack food, snack food, gifts from Grannymom, snack food, school work, snack food and some candy. On that seat is pull ups for Whitman, cookies from Shannon, my camera. There is also the diaper bag, a box of dressier clothes in case we go to a show in NYC, another bin of snack food, our lunch food in a big bin and a trash can. 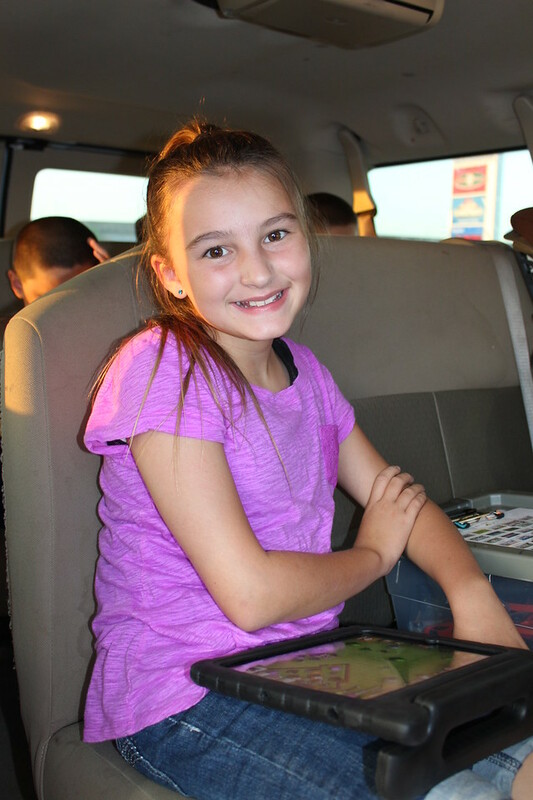 Between each seat of kids is a box with all kinds of stuff-candy, paper, colored pencils, slug bug and license plate games for them to play, some toys they have packed (trains, legos, baby dolls), radios and headphones. The girls all have purses with them as well. Reagan and Whitman are on the next row and under them is floatees for Keaton and Whitman, 3 of the kids backpacks, Robby’s tackle box full of cords-enough to power a space shuttle, a bin of rain coats, a bin of bathing suits and then I know you would never believe it but there is also 2 tiny bins filled with snacks. Anderson and Graham are next and they have a box filled with extra stuff underneath them (extra quarters, extra laundry detergent, a football, frisbee, our national park passport books, scissors, tape, pretty much everything but the kitchen sink is in that bin). There is also 3 more kid backpacks, 2 more buckets of snacks and another stash of pull ups. Then we have Campbell and Keaton and they have my clothes, Robby’s clothes and a few cokes under them and behind them wedged in between the door and the back of their seat is 2 strollers. I know it sounds like we are packed in this big ole van and we really are! Robby and I arrived at Pops and Nonna’s house right at 5 and the kids were already picking up and putting on their shoes. Whitman was still playing in the bathtub and while everyone got busy, I had enough time to grab me a bite of supper and some crock pot cake that Nonna was trying out. Robby had already eaten a bite at home so we were all fed and hopped on the road to begin our Epic Road Trip. We listened to a book on tape (finished one and started another one) for a good while. Then we passed out their ipads for a bit. Graham had to potty before Memphis and Robby took that opportunity to top of the gas tank. Whitman was acting really puny then but we just assumed he was tired. He wasn’t just tired and when he had told me that his tummy hurt I should have taken him more seriously. Poor guy! I am still pretty nimble and was able to leap over a seat or two catch most things. Reagan was able to pass me some wipes and I had Whitman pretty clean by the time Robby pulled over at a trash can. He threw things away and changed Whitman while I used the carpet cleaner and fabreeze to clean his seat. This little stop just cost a few minutes and soon we were back on the road. Whitman felt tremendously better then and happily watched his ipad for the next little bit. Soon we were crossing the Mississippi river and heading on down the road. We had originally planned on going to Jackson tonight but Robby moved it a little further down the road to Lebannon. We turned on a movie around 8:30 and everyone was quiet for a good while. The movie was The Apple Dumpling Gang that we had from the library. I tried to get a few new movies for Reagan; she likes ones with real people and really those are more enjoyable for the rest of us. This one was cute and everyone (including Whitman) paid attention to it. Somewhere along the way, we pulled over at a rest stop for me to drive. Keaton and Whitman went in to use the restroom with Robby. By this time, Whitman was feeling much better and when Robby gave him something to drink after that, he told Reagan that it made him feel good. Hopefully, his episode was due to his yucky cold that he has right now. I drove almost to Nashville. Robby passed out ipads after the movie was over and everyone stayed awake for a good long time. Whitman did go to sleep after 10. You would think that we are traveling to the arctic-everyone in the back is covered up with a towel or wearing their jacket. Reagan even had on her hood at one point. It is not cold in this car at all but their air conditioner in the back is all or nothing. Low is really cold and off quickly becomes hot. Now when we were in Dallas a bit ago, low was still hot and high was still hot but I guess that happens when it is a 110 degrees outside. Hopefully, we won’t have temperatures that warm on this trip but if we do, Robby has 2 fans for the back row girls to use. It was nearly 11:40 when we arrived at the hotel. The kids had been fine on the last leg of our journey. As is our norm, while Robby checked in I climbed in the back and we all started cleaning and gathering what needed to go into the motel. Tonight is a motel and really, we kind of love it-no being quiet in a hallway, no having to sneak in (more on that another time) and being able to park right next to the door (though we weren't exactly able to tonight.) We would have been able to bring everything in tonight in one trip if I had remembered the sleeping bags and if Whitman had been awake. But we did make it without a cart and that is a happy day. It is a good thing that we didn't use a cart since there would have been no way that a cart would have fit in this room. As it is, Anderson is sleeping on the sidewalk outside. (Mom, I am kidding.) We are packed in this room like sardines and right this moment (12:20) everyone is sleeping soundly. There were a few bumps in the road today (literally and figuratively) but overall, this first day of our Epic Road Trip couldn't have gone any better and I promise that there will be lots more pictures tomorrow!